Oh snap! 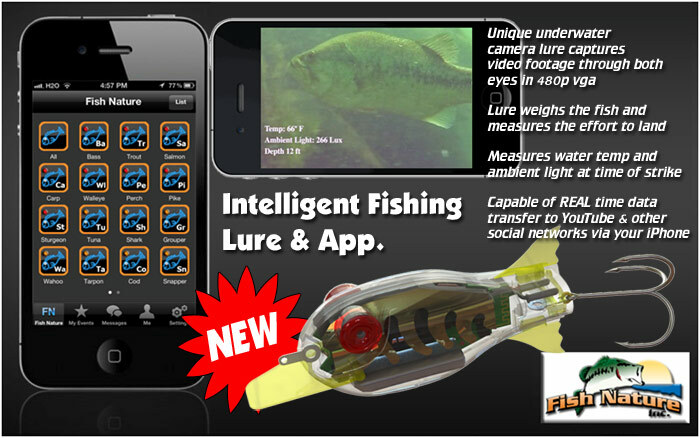 The secret weapon to catching fish is here...are you all ready to go all iPhone app and digital camera up on some bass? Well, then this is for you! There's so much technology here, I've not no freakin' idea what's going on, but I do know that you clearly need one. All the cool kids on the iPhone fishing team will have one. I mean, it even transfers your real time data to social networks...holy crap...or is it holy carp...why waste your time letting everyone know where you got an oil change on Foursquare...when you can turn that time into productively becoming the Mayor of Electronic Lureville! Make George Jetson proud and "Kickstart" yourself into the futuristic age of smartphone fishing HERE. It can't possibly cost much more than an average Rapala at cabelas.. but can it make coffee? Only $175,000 to kickstart this project. That would be a damn pricey Rapala. We gonna need an Android version! Agreed. WTF are they thinking? Do they make one that works with smoke signals. Rub two sticks together and see what happens. I've seen some great stuff in my years of chasing bass and trout, but this has to be the best invention ever. Why, I can just see it now - the fish showing up on the screen, the screen telling me it'll take 4.5 lbs. of pressure to land it, me saying "oh crap, that fish is way too much trouble" and then....it hits the camera lure and I am forced to land it anyway. I even have to put down my sammich before I'm finished eatin' it. No sir. I can't say that I'd be interested in this thing as great as it sounds. I'm just too devoted to my sammiches. If the sammich's constructed with Goober Grape & Marshmallow Fluff, I'm in total agreement. WTF? Will it throw a tantrum like a 5 year old when "the big one" gets away or do I still have to do that? You still have to. But I hear you're worse than a 5 year old. Have you been talking to my 6 year old? I think this is a good invention. It doesn't have to work, it just has to sell. I wouldn't be surprised to see your wife picking one up in December. I'll keep my eye's peeled for the "iphone lure factory." You know, one of the advantages of getting old is that you don't have to follow all that smart phone technology and no body cares. This way you don't have to worry about your lure downloading that big Bass hit automatically out on YouTube. It doesn't do that?